Use our online ordering system and save £10 from your order. Click the button to order now. 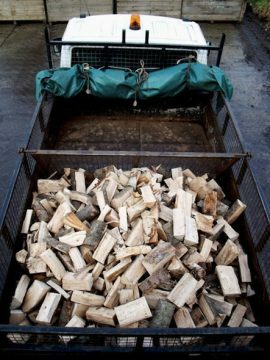 Winton Wood Fuel’s high quality, seasoned logs are produced from local timber from sustainably managed woodland on Winton Estate and from other woods. Choose from loose logs for your wood shed or convenient nets if you have less storage space, all delivered to your door. So, if you are looking for seasoned logs for sale in East Lothian, Midlothian or Edinburgh, look no further! (Delivery is subject to your postcode – check table). Note: the logs are delivered loose without the box! Logs are about 8 inches in length. Our seasoned logs are sold as “loose logs”. They are machine cut and supplied in a wooden create measuring 0.75m by 1.75m by 1.15m. The crate is filled to the top, but naturally there is space between all the logs. This allows air to circulate and the logs to dry in our sheds. We strive to be as sustainable as possible so all our seasoned logs are air dried. There is no mechanical drying of our logs and as a result we need to allow space for air to circulate. UNSEASONED Perfect for customers who have space to dry their own logs. They have not had time to season naturally and are sold as freshly cut logs. KILN DRIED Our kiln dried logs are stored in a heated drying shed in temperatures up to 70 degrees. SEASONED The Log crate is loose filled which naturally leaves space between all the logs. This allows air to circulate and the logs to dry in our sheds. *(Net bag orders placed online will be contacted by the sales team to arrange a suitable delivery time. We only sell seasoned net logs). We do not deliver to EH4, EH11-12, EH27-30, EH43-49 and EH51-55. Place your log order online and register as a customer now using our new eCommerce system. If circumstances change, we reserve the right to alter or modify your delivery time. We will notify you in advance of any changes. When booked for delivery your whole box is tipped into our delivery van and delivered to you. Naturally, when 1.5 cubic metres of loose logs is tightly stacked, it takes up less room than it did originally in its loose state and this can be as much as 0.5m in volume. This is reflected in the price we sell our logs for. There are a number of factors which contribute to the size of the pieces of wood in our boxes. The type of wood (beech, ash or oak), dampness of logs when split and the growth of the tree (ie how many branches it had when it was growing). Whilst our machine does “sort” smaller pieces of dross, there will sometimes be smaller pieces in log deliveries. These pieces could have split off naturally during transit or separated during natural drying. We do vary the type of wood which goes into each box as much as possible to give our customers an even share of the mix, however between seasons there may be bigger discrepancies. Wood chips are also available for sale for boilers, gardens and other uses: the price per tonne is £80 plus VAT (@ 5% VAT equates to £84 per tonne) for pick up from the wood mill near Winton House. (Delivery is not currently available). Please call 01875 340222.